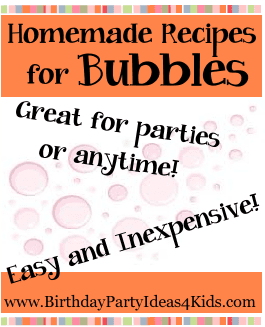 Our favorite homemade do it yourself bubble recipes for HUGE bubbles, colorful bubbles and high flying bubbles! The best bubble recipes that are easy and inexpensive. Make a large batch for birthday parties or a smaller batch for playtime and play dates. The bubble solutions can be stored in a sealed container. Try storing in the refrigerator - cool bubbles tend to hold together better. All the bubble solutions and mixtures can be made ahead of time. Letting the solution rest for a few days makes for better bubbles! See both of Bubble related party pages! 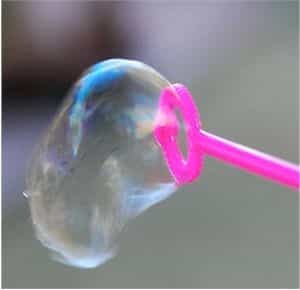 Bubble party theme for fun Bubble party theme ideas, games, activities, party food, decorations and invitation ideas. 30 fun things to do with Bubbles for games and activities to play with blowing bubbles! Make up a big batch of Bubble mixture and set out lots of bubble wands in all shapes and sizes. Some fun ideas for bubble wands: Wire coat hangers bent in a circle shape, slotted mixing spoons, plastic lids with circles out, almost anything that forms a circle. The longer you let the bubbles set before using the larger the bubbles will be. Use Joy or Ajax brand Dishwashing Soap for best results. Use a large plastic drink dispenser with a spout at the bottom to hold the bubbles. Kids can stop by and re-fill their bubble containers quick and easy! Place 1/2 of the warm water in a bucket. Stir in Cornstarch until dissolved. Mix in the other 1/2 of the water. Mix in Soap and Glycerin. Stir in soap carefully trying not to create bubbles or foam. Let the HUGE Bubble mixture sit 1 hour (or longer) before you use it. When ready to use stir the mixture slowly for 2 minutes to make sure all the ingredients are incorporated. This mixture has a tendency to settle while in use so stir once every 15 minutes. Mix all ingredients together gently. If a foam starts to appear while you are mixing skim it off the top with a large spoon. Mix all ingredients together slowly. This recipe will give you high flying bubbles that last a long time! Mix all the ingredients together. Store in a container with a tight lid. This mixture should be used OUTSIDE. Because of the food coloring in the mixture it will stain carpet, tile, furniture, etc. Stir all bubble ingredients together slowly until Jell-O is completely dissolved. Use OUTSIDE because the mixture will stain. 30 great games and activities with Bubbles - our favorite games and activities for kids, boys and girls to play with blowing bubbles!